The biggest winner from yesterday's high stakes games at PokerStars was French pro Rui "PepperoniF" Cao who earned $125,997 after a heads-up win over Finnish pro Sami "Lrslzk" Kelopuro. The pair first got together early yesterday morning where they played for half an hour at a couple of $100/$200 tables, resulting in a $32k win from 63 hands for Lrslzk. PepperoniF made up some ground a few hours later when he won $46,039 from a half hour session at another $100/$200 PLO table against Grazvis1, before losing $45k soon after to ActionFreak. Lrslzk got back to the tables some 8 hours after his initial win over PepperoniF and once again the pair played heads-up at the $100/$200 tables for 2.5 hours, playing at three tables in total, with PeppoeroniF winning at all three tables played. The first table ran for an hour and a half, in which time the French pro won $82,059. 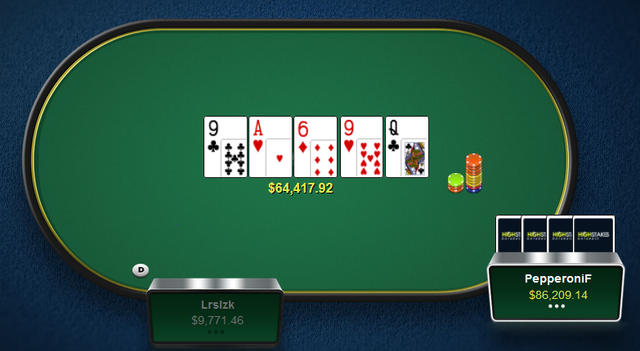 The change of tables didn't help Lrslzk as his French opponent added another $28,158 from 62 more hands. An additional table was added partway through the aforementioned $28k loss for Kelopuro, resulting in another $47,405 for PepperoniF from just 22 hands. In second place on yesterday's leaderboard we find another PLO specialist in ActionFreak who ended the day with a $47,715 profit, most of which came from the previously mentioned early afternoon games against PepperoniF. Third place went to UK pro Luke "Bit2Easy" Reeves after a long day of table-hopping at the $25/$50 and $50/$100 NLHE tables for a $27,717 profit, and in fourth place we find PLO player BlackFortuna who did a fair amount of $25/$50 and $50/$100 table-hopping himself on his way to a $23,893 win for the day. For all yesterday's results go to our results page, or for current action check out the live results section.